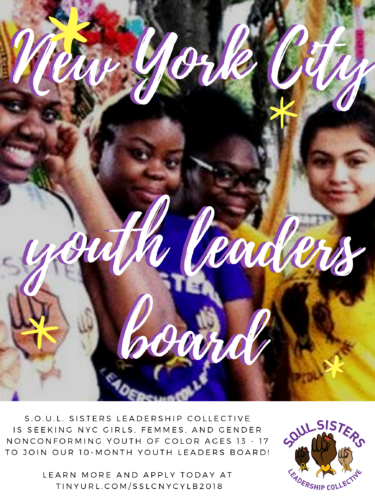 S.O.U.L Sisters Leadership Collective | Deadline Extended: Join the NYC Youth Leaders Board! Deadline Extended: Join the NYC Youth Leaders Board! Extension: We are accepting applications and scheduling interviews through Friday, October 5! The Youth Leaders Board is S.O.U.L. Sisters’s founding program, providing girls, femmes, and gender nonconforming youth between the ages of 13 – 17 the opportunity to participate in activism and social justice actions through Sisterhood. This cycle will run from October 2018 – July 2019, providing stipends, MetroCards, and food at meetings, events, and retreats. YLB members are expected to commit to a minimum of monthly 3-hour meetings, and there are opportunities to travel out of state for youth leadership conferences and social justice events. Interviews are roughly 30 minutes between the hours of 3 PM – 6 PM. Our office is located at 147 Prince Street, Brooklyn, NY 11201. After completing the application form, we will contact you to schedule your interview. For questions or concerns, please reach out to our YLB Coordinator Jaryanna Rivera at jary@soulsistersleadership.org or (607) 699 – 1375.